Our bottle is not only beautiful, it is an embodiment of generations of family values. When the family emigrated from the Caribbean, glass bottles were not manufactured locally in the abundance we have today. Like many immigrant families of that era, they would be completely unfamiliar with today’s throw away culture. Every type of packaging brought into the home would be re-purposed and reused in as many iterations as creativity would allow. Careful mending and repairs applied when needed and when broken beyond repair, reimagined as the building blocks for something new. A beer bottle would hold the latest batch of pepper sauce, a jelly jar would house homemade preserves, and when chipped beyond that use morph into containers to organize screws and nails in grandpa’s workshop, hold notions in a sewing box, or nurse an avocado seedling. We honored this tradition by carefully selecting our packaging to be durable, reusable, a reflection of our cultural heritage and commitment to bring you freshest and most delicious sauces, marinades and spice blends. We were the first local food company to use these bottles in Utah; they’re expensive but worth it to us because you’re more likely to reuse it in your home. If you don’t want to keep the bottle, we sterilize and reuse them and give you $1 off your next purchase. This summer, our customers have already kept more than 350lbs of glass out of the waste stream. This entry was posted in Green Pepper Sauce, Orange Pepper Sauce, Red Pepper Sauce on September 13, 2015 by admin. What is a Pepper Sauce? Pepper Sauce is a Caribbean style hot sauce. 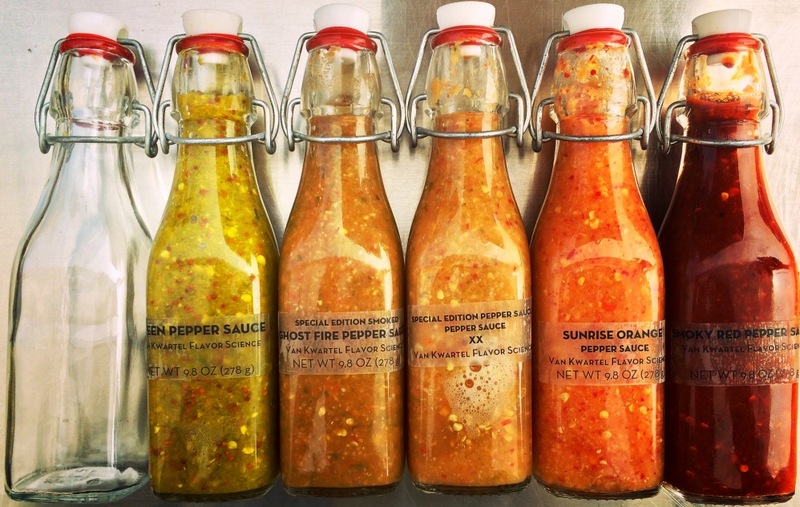 These spicy condiments are made in small batches from the freshest ingredients available. Thicker in consistency than sauces we are accustomed to purchasing in stores, a little goes a long way. Our sauces are made fresh each week without preservatives or additives and should remain refrigerated to preserve that special taste. Shake well, as there are no emulsifiers in our sauces. Special Edition Pepper Sauces are made with locally grown chilies while the varietals are producing and in season. Our latest, Purple Tiger’s Claw, features Purple Tiger and Hot Portugal peppers from Earth First Eco-Farms and Purple Cayenne Peppers from Mololo Gardens. We thank them for their long standing commitment to bring delicious, healthy produce to market. Red, Green and Orange Pepper Sauces: add a few drops while cooking to add depth of flavor to your meal, or after cooking for full strength heat. Mix with sour cream, yoghurt or mayonnaise to achieve the level of heat you desire in a spicy spread. Jerk Marinade: coat your meats, game, poultry, fish, tofu or vegetables with a thin layer and cook. Reserve a portion of the marinade for use as a sauce after cooking. Sofrito: enjoy with chips like a salsa, use as tradition states to flavor your rice, bean and vegetable dishes. Marinate delicate flavored shrimp, seafood, fish or chicken breasts before cooking. Add to soups and stews before serving to add bright, fresh flavor. This entry was posted in Green Pepper Sauce, Jerk Marinade, Orange Pepper Sauce, Red Pepper Sauce, Sofrito on August 9, 2014 by admin.